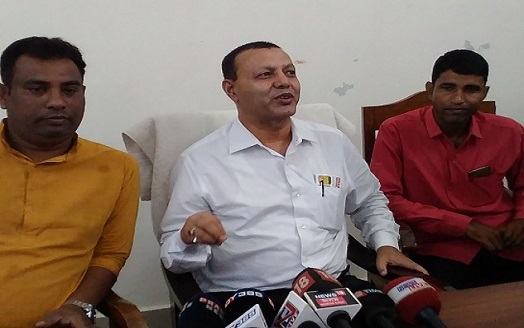 Former Assam minister Siddeque Ahmed on Friday afternoon said he is ready to sell off his property at a lesser price. “My property won’t be more than 10 crores and I am ready to bargain and sell it off even for a lesser price,” Ahmed said. He was referring it to the waiting media at circuit house in Silchar, when a team of anti corruption wing is stationed at Karimganj to check his property which they have tugged under disproportionate assets case. Investigation for property belonging to Siddeque Ahmed and that which has been registered under various names including his wife, daughter and sons going on for the past three days beginning Tuesday. In 2016, the assets disclosed before his filing of nomination stood at rupees two crore which as per Siddeque Ahmed himself, stand at around Rs 10 crore owing to the rise of prices of property in past two years. He added, “I come from a family of farmer for which I have invested in paddy fields, rubber cultivation and fisheries that has been passed on to me by my fore fathers. If I have made all of these through corruption, than prove, for which work I have done it, being an MLA or a minister,” he quizzed. “I strongly condemn the malicious attempt to tarnish my image. Some political parties and their representatives have been assigned to overthrow me for as to pave their way for the next elections. Congress, BJP and AIUDF are involved, but, I won’t take anyone’s name, for it is up to you to find out,” Siddeque Ahmed said.